For the most part, starfish are easy to keep in an aquarium. But the precise level of ease varies among species. Their food requirements and their level of willingness to cohabit with other captive marine creatures factor in. Keeping starfish happy is mostly a matter of understanding their needs and catering to them. Starfish are echinoderms, saltwater-dwelling animals that creep slowly from place to place using their sticky tube feet. 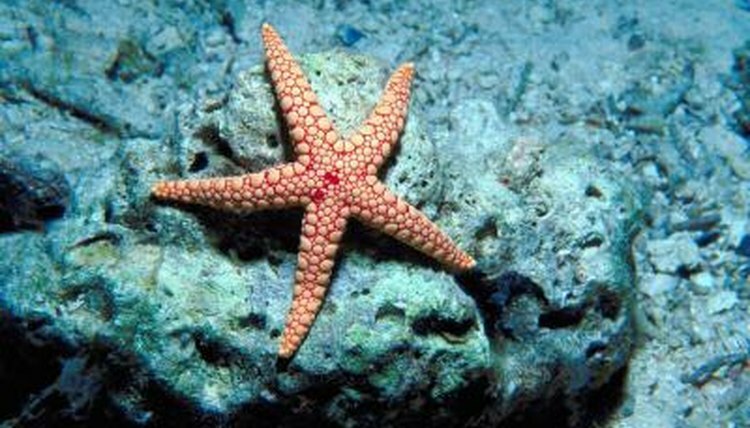 Most starfish have five arms, which they can replace if lost, though some have nine or 10. Each arm exhibits a double row of feet, which the creatures use both to move and to breathe. More than 2,500 species of starfish are known. Those most commonly available for aquariums hail from the families Oreasteridae, Himerometridae, Ophidiateridae and Ophiomyxidae. Many species of the Linckia genus, in the Ophidiasteridae family, are available for aquarium environments, where they will happily clean up bacteria that naturally form on rock surfaces, glass walls and gravel or sand. Although you don't need to provide extra food, however, you should introduce them only to active aquariums where other animals have been living for a while. This way a buildup of the bacteria they feed on will already be present -- if it is absent, they will starve. Others, like the royal starfish (Astropecten articulatus), need a variety of fish food to sustain them, otherwise they will starve and decay. Still others eat live prey, so determine the dietary habits of the species you're considering before placing them inside your aquarium. Several starfish are predators who do not coexist well in reefs. Bahama stars (Oreaster reticulatis) of the family Oreasteridae, for instance, will eat soft corals, sponges, tubeworms, clams and other starfish. They will not touch fish, however, so if you wish to house one in your aquarium, the environment will have to be a simple fish habitat. Linckias, on the other hand, do just fine in both all-fish and reef environments, since they subsist solely on bacteria. Some, like the red knobby sea star (Echinaster echinophorus), which eats sponges, will feed on just one type of invertebrate but are safe to be around others. Although starfish thrive in the right environments, they are sensitive to changes in water temperature, acidity or salinity. An aquarium environment should be between 72 and 78 degrees Fahrenheit for most starfish, and stable. Keep salinity levels between 1.020 and 1.026, and adjust salt levels slowly when you need to, as rapid changes can damage their feet and vascular systems. Most starfish prefer pH levels between 8.1 and 8.4. Requirements vary by species, so always check. The red knobby sea star, for instance, prefers temperatures of 77 to 79 degrees Fahrenheit. How Much Space Does a Starfish Need?